ISI FESTA 2019 took place at the Shinjuku Bunka Centre on 28th January 2019. 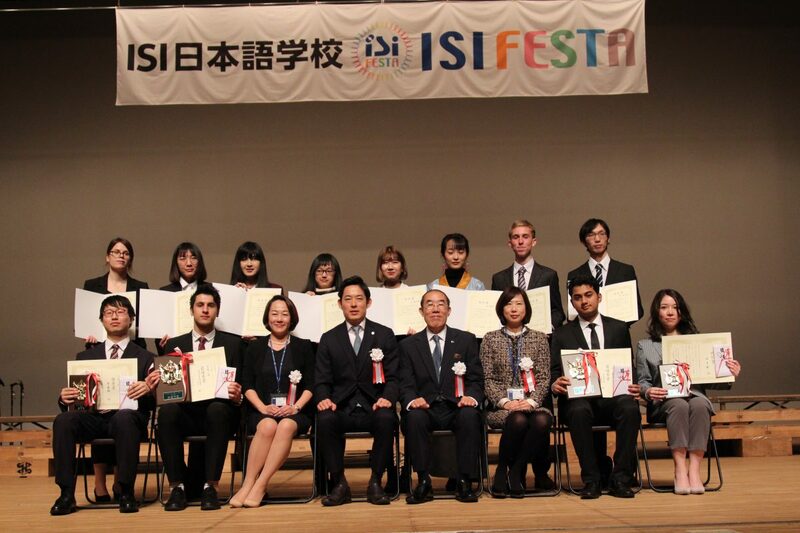 ISI FESTA was a large scale event, with 1700 people from over 65 countries around the world gathering at the Shinjuku Bunka Centre, including over 100 special guests, to watch our students exhibit the results of their hard work and effort over the last year. The first part featured a speech contest. 12 participants delivered a speech in Japanese as their classmates cheered them on, based on the themes “Me before I came to Japan, and me after I came to Japan” for the Intermediate Level participants, and “Me, Japan, and the world: in ten years time” for the Advanced Level participants. The second part showcased various performances from our students, and from guest musicians and singers. Our guest performers included TAEKO GLORY, Wagosnation Gospel Choir, and AUN & HIDE, who sang of Japanese hospitality and the Japanese heart. They put on a special performance, and left a strong impression on the audience. This year ISI Group received incredible support from our sponsors in creating ISI FESTA, from companies, organisations, and individuals, many of whom donated prizes for the speech contest winners and participants. ISI FESTA was a huge success again this year, and will undoubtedly become an important memory for our students graduating in March. There were students from many different countries, and I was surprised by the speech contest participants’ high level of Japanese. I’d love to see them come and visit our university one day. I saw students from Iran, Germany, South Korea, China… so many different backgrounds, and I felt like I was seeing Japan’s future presented before me. It was very exciting. The speech contest participants pointed out things I’ve never noticed as a Japanese person, and I was amazed by their accurate use of Japanese. I could sense new bonds being formed between international students and Japanese people, and Japan and the world. I was surprised by how well the students could communicate in Japanese. The speeches all focused on Japan’s future and were truly excellent, and I’m confident people like the students I saw today will make a truly global society in the future. I’m looking forward to seeing what they do from now on. Everyone’s speeches were excellent and I was really moved, and to be honest, everyone in the first half was so good I became really nervous and thought first prize was impossible, so to be picked for first place was took me by surprise. I’m really happy. I am truly grateful for receiving first place. I don’t think I’ll ever forget this moment. Thank you for everything. It’s a shame I didn’t get first place, but I put everything I had into my speech and I have no regrets. It was an excellent experience. Thank you. I am still relatively new to learning Japanese, yet thanks to my teachers’ guidance and my classmates’ support, I manage to win a prize. I am truly grateful. We’ll see you again at next year’s ISI FESTA!